A 3-person team of Pakistani students, including a female student from Islamabad's National University of Science and Technology (NUST), won first place in a contest organized by Stanford Center of Longevity. The team's entry is a device they designed and prototyped that enables tremor patients to perform daily routine tasks. The purpose of the contest is to encourage innovation to help improve the quality of life of aging populations in the West and the rest of the world. NUST's Hooriya Anam, Awais Shafique, and Arsalan Javed defeated teams from around the world with their anti-tremor prototype project TAME. The team from famed Massachusetts Institute of Technology (MIT) placed second while Virginia Tech team stood third, according to results announced by the Center. In addition to NUST, MIT and Virginia Tech teams, there were other teams from Cornell University, University of Sao Paolo Brazil, China's Beijing University and Silicon Valley's Stanford University who also competed in the contest. The winners received $17,000 in cash prizes along with paid travel to Stanford where they presented their designs to industry, academic, and government leaders. 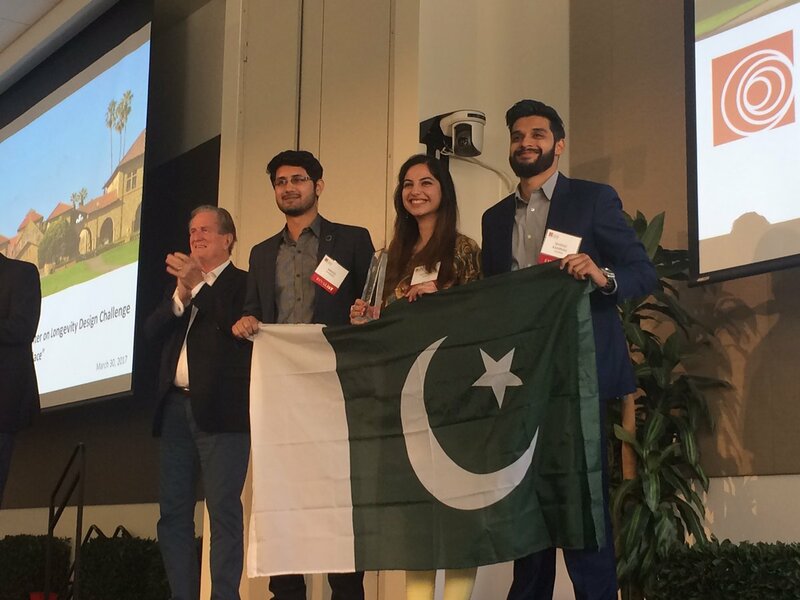 Wins such as the Stanford Challenge are the result of improvements in higher education in Pakistan since the year 2000. Pakistani students, scientists and researchers are continuing to produced highly recognized and cited research in spite of serious economic and security challenges. 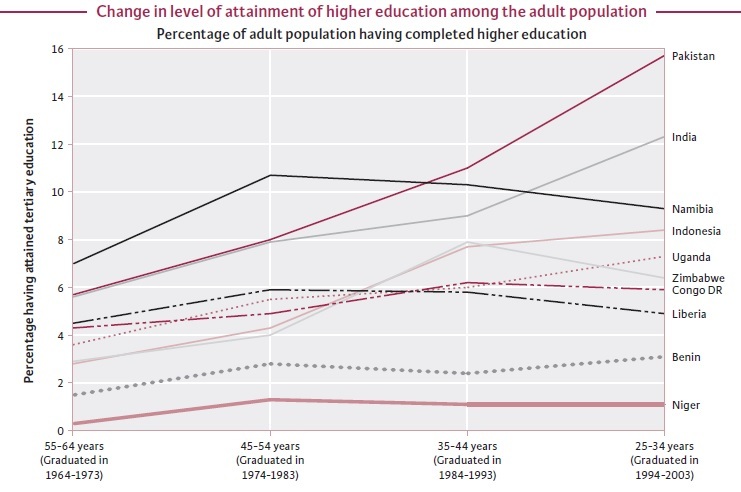 Enrollment in higher education is rising and giving a boost to innovation. 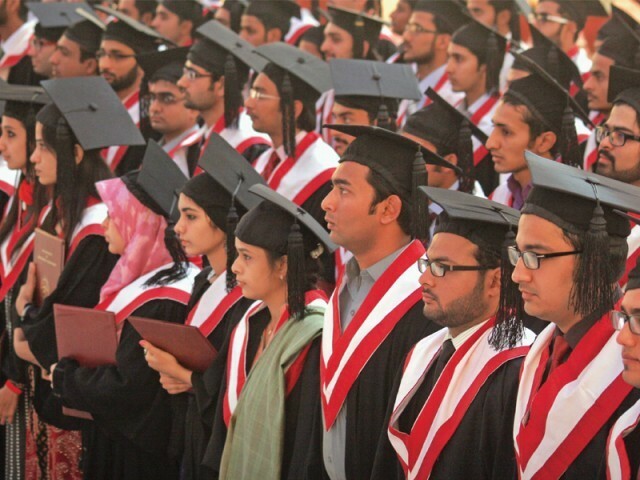 With better policy focus and more investment in higher education, Pakistan can make an even greater impact with its young demographics. 2.6% of 17-24 yrs of age group enrolled in higher education in 2000 jumped to 13-14% now. Access to education beyond higher secondary schooling is a mere 10% among the university-age population in India. This is the finding of a report "Intergenerational and Regional Differentials in Higher Education in India" authored by development economist, Abusaleh Shariff of the Delhi-based Centre for Research and Debates in Development Policy and Amit Sharma, research analyst of the National Council of Applied Economic Research. The report says that a huge disparity exists — as far as access to higher education is concerned — across gender, socio-economic religious groups and geographical regions. The skew is most marked across regions. Thus, a dalit or Muslim in south India, though from the most disadvantaged among communities, would have better access to higher education than even upper caste Hindus in many other regions. Interestingly, people living in Bihar, Uttar Pradesh and West Bengal — designated as the north central region — and those in northeast India have the worst access to higher education. Those in southern India and in the northern region — consisting of Jammu & Kashmir, Punjab, Himachal Pradesh, Uttarakhand, Chandigarh, Haryana and Delhi — are relatively better placed in this regard. In the age group 22-35 years, over 15% in the northern region and 13% in the southern region have access to higher education. In the north-central region, the number is just 10% for men and 6% for women whereas in the northeast, only 8% men and 4% women have access to higher education. The report, brought out by the US-India Policy Institute in Washington, is based on data from the 64th round of NSSO survey 2007-08. It throws up quite a few other interesting facts. For instance, among communities, tribals and dalits fare worst with just 1.8% of them having any higher education. Muslims are almost as badly off, with just 2.1% able to go for further learning. Similarly, just 2% of the rural population is educated beyond higher secondary level, compared to 12% of the urban population and just 3% of women got a college education compared to 6% of men. South India offers the best opportunities for socially inclusive access to higher education including technical education and education in English medium. For instance, the share of Hindu SC/ST in technical education in south India is about 22%, and the share of Muslims 25%. These were the lowest shares among all communities in south India. But this was higher than the share of most communities including Hindu OBCs and upper caste Hindus in most other regions. South India also has the highest proportion of higher education in the private sector at about 42%, followed by western India where it is 22%. The northeast has the least privatized higher education sector and is almost entirely dependent on government-run or aided institutions. This is an electric honeycomb. It’s what happens when certain kinds of electrically charged particles travel between a pointy electrode and a flat one, but bump into a puddle of oil along the way. The polygonal pattern that emerges is what some physicists also call the rose-window instability, because it resembles the circular, stained-glass designs found in Gothic churches. It’s what happens as natural forces work to keep an electric charge moving in an interrupted circuit. This visualization reveals fundamental principles about how electricity moves through fluids that engineers can use to develop technology for printing, heating or biomedicine. But it also reminds us that humans aren’t the only ones seeking stability in an unstable world. Even tiny, unconscious objects need balance. You can see similar patterns in wax honeycombs, fly’s eyes and soap bubbles. Physicists knew of this phenomenon decades before Muhammad Shaheer Niazi, a 17-year-old high school student from Pakistan met the electric honeycomb. In 2016, as one of the first Pakistani participants in the International Young Physicists’ Tournament, he replicated the phenomenon and presented his work as any professional scientist would. But he also developed photographic evidence of charged ions creating the honeycomb, and published his work Wednesday in the journal Royal Society Open Science. But first: How does the honeycomb form? Just about every electronic device in your home contains capacitors, which store electricity, a bit like a battery. Electricity travels from the top electrode, through the insulator, to the bottom, or ground electrode. An electric honeycomb behaves like a capacitor. In this case, the top electrode is a needle that delivers high voltage to the air just a few centimeters above a thin layer of oil on the other flat, grounded surface electrode. The high voltage strips molecules in the air of their electrons, and creates what’s called a corona discharge, pouring down these electrically charged particles, or ions, like water from a fountain, onto the surface of the oil. Just as lightning strives to strike the ground, these ions want to hit their ground electrode. But because oil is an inefficient conductor, they can’t get through it. “We can say this is frustrated lightning,” said Alberto T. Pérez Izquierdo, a physicist at the University of Seville in Spain whose 1997 work on the subject inspired Mr. Niazi’s project. The ions start accumulating on top of the oil until their force is too much. They sink down, forming a dimple in the oil that exposes the bottom electrode, allowing them to find their ground. But now, the surface of the oil is no longer even. Within milliseconds, dozens of hexagonal shapes form in the layer that help maintain the equilibrium nature demands. The polygons keep the amount of energy flowing into and out of the system equal, and balance two forces — gravity, which keeps the oil’s surface horizontal, and the electric field pushing down on top of it. To prove that the ions were moving, Mr. Niazi photographed images of the shadows formed by their wind as they exited the needle and recorded the heat presumed to come from the friction of their travel through the oil. Heat appeared to originate at the needle, and dissipate outward, increasing with time — even five minutes after the honeycomb formed. The thermal images puzzled Dr. Pérez Izquierdo. Neither he nor others had previously explored temperature changes on the oil’s surface, and he would have expected a smaller and more even heating effect than Mr. Niazi observed. Determining the heat’s origin is an interesting question that requires more study, he said, while also praising Mr. Niazi’s experimental skill. “I think it’s outstanding for so young a scientist to reproduce these results,” Dr. Pérez Izquierdo said. The biggest science Olympiad of the country, PsiFi, which is hosted by the Lahore University of Management and Sciences’ Society for Promotion of Engineering and Sciences is set to start from tomorrow. PsiFi is entering into its 9th edition, thus the name “PsiFi IX”. The first edition of the series gave LUMS the honour of being the pioneer of Science Olympiads in Pakistan. Since then, PsiFi has been held on an annual basis and each event promises a better experience than before. SPADES’ executive body is determined to make this year’s event a success, putting in days and nights to ensure that the participants have an exhilarating start to the year. PsiFi consists of a bundle of science-oriented competitions. It revolves around 16 academic events and 4 socials spread over 4 days, starting from the 13th till the 16th of January, 2018. SPADES quotes the drive to counter the narrative of science being a “boring” field as the root cause of the efforts to make Psifi a “Feast of Fun”. It has set out with all the right weapons required to convince everyone that science is fun and interesting. This event is based on 3 rounds, starting off from a Crisis scenario wherein participants will take up the role of a paramedic and try to counter the crisis situation, participants will put their surgical ability to test and pull out a tumor from a dummy without damaging internal organs. This event aims to bring out the Matt Damon in everyone and test their knowledge of space and planets. Nowadays, space travel and the possibility of people living on other planets is constantly being explored by governments and firms like SpaceX. Now, students have the chance to present their proposals in front of a learned judging panel. Galactica, where limits extend beyond the sky. This event is bound to exploit the movie and seasons knowledge of the participants. Based on 5 rounds, this event will bring out the sci-fi movie nerd inside everyone. The rounds will comprise of MCQs, riddles and dares, all of them aiming to bring the Sci-Fi element in Psifi! This event is all about laughter, humor and the best thing in our lives: Memes! Based on 3 rounds in addition to a bonus round, this event will comprise of participants making memes out of images given to them and using imaginary gadgets in (hopefully) funny videos. This event promises to be one of the most enjoyable of the roster of events, and rightfully so. After all, what’s life without laughter, right? Other than the academic events, Psifi will also host 4 social events including a concert which is bound to be the highlight of the event. Starting from the amazing opening ceremony all the way up to the Black and Gold themed Closing Dinner, the socials will be an amazing remedy for the stress from the academic events. Two years ago when Faizan Khan woke up in hospital following a car crash, he rubbed his eyes hard but still couldn’t see a thing. He initially thought it was an effect of the trauma from which he would recover with time but he had in fact been blinded. Faizan and millions of visually impaired people like him now have a chance to make sense of their surroundings with the help of Sonic Eye, a device that acts as a navigational prop through the medium of sound. The innovative device has been developed by 23-year-old Hifza Jamal, a student from Peshawar in the north-western province of Khyber Pakhtunkhwa — signifying how young Pakistani women in the field of technology are transforming society. Talking to Gulf News, Hifza explained that Sonic Eye is basically a stick that is attached to a navigation system. “This navigation helps to identify the objects in the path. These sensors alert the visually impaired with a loud sound when an object is nearby,” she said. “The device releases frequencies in the shape of a cone, which when they come in contact with any object in a certain range, activate the buzzer,” said Hifza detailing her invention. The device can indicate obstacles ahead and makes it easier for visually impaired people to find their way around. The device could be extremely useful for not only the blind but also the partially blind or people with complex eye diseases. During her research for the project, Hifza spoke to several visually impaired persons as well as eye therapists to understand the problems faced by people with vision loss. Determined to instil hope in the physically challenged population of Pakistan, Hifza decided to resume work on her university project. “Sonic Eye was basically my university final year project made with the help of my colleagues under the supervision of my professors,” said Hifza, who completed her Bachelor of Computer Science degree from the Institute of Management Sciences Peshawar. “I am perhaps the first one to launch this technological device in the province of Khyber Pakhtunkhwa,” she reckons. Hifza is currently busy working to develop a mobile app that will be able to offer a navigational aid for the blind without even having to use the stick. The app has image processing, face recognition and object detection features, which will help partially sighted persons perceive their surroundings with the use of a mobile camera. “The app is basically aimed at partially blind people,” Hifza explained. Hifza is also the co-founder of Sympathizers, an organisation working to provide better education, health and everyday facilities to special people in Peshawar. Armed with the Sonic Eye and the app she is working on, Hifza aims to bring about a phenomenal change in the lives of people with visual impairments. “This technology can allow sightless people to live an independent life,” she said. Pakistan needs a balanced mix of quality skilled workers, technicians, technologists, engineers, researchers and development scientists to promote the country's industrialization. National University of Technology is Pakistan government's answer to fulfill this need. The problem with Pakistan’s technological education hitherto has been a surfeit of theory adept engineers, who lack practical skills upon graduation and are therefore of limited use for industry that demands hands on technologists, who could run industrial processes with the desired degree of competence. NUTECH seeks to fill that void through degree programs that will give both respectability and international recognition to the technologists who would undergo four year degree programs in different disciplines of engineering technology. These engineering technology graduates would be exposed to a curriculum geared towards practical aspects of technology that come in handy for an industrial employer. While the engineering degree holders would concentrate on designing and policy aspects the graduates of NUTECH would be focused on actual execution of technological tasks on shop floor. With a practical orientation these engineering technology graduates would already be adept in engineering practices on graduation unlike a normal engineering graduate whose learning starts upon graduation. The production of top quality engineering technologists accredited to top class international technology regimes like the ‘Dublin, Sydney, and Bologna Accords’ would be a big shot in the arm for our human resource starved industrial sector. As a pioneer technology university under the Ministry of Education and affiliated with the Higher Education Commission, the University is charged with forging a direct linkage with the industry. While NUTECH would be mainly conducting Degree Programs, it is capable of reaching out to less developed areas through its widespread network of technical and vocational training institutes, producing skilled workers for the industry. With more focus on hands on practical training and inclusion of the industrial sector as a stakeholder in designing of curricula, it would synergise the academic output for the benefit of industry. Pakistan that has suffered because it has completely bypassed industrial development by taking a shortcut to the services sector. Without industrial sinews, no country in the contemporary world can enjoy sustainable economic development. The time has come to correct that egregious flaw in our national development planning through sustainable initiatives. NUTECH is one such initiative, which was long overdue. If someone begins struggling to breathe on their own, machine ventilators are the best way to keep them alive. Unfortunately, the high price of the machines forces many hospitals in the poorest regions of the world to rely on a simple solution known as an Ambu Bag that requires hospital staff or even a patient’s own family member to apply constant manual pressure in order to get oxygen to the lungs. Ambu Bags are imprecise and carry their own risks, which helps explain why respiratory disease is one of the leading causes of death in more than 60 developing countries worldwide. On Feb. 21, the student team Umbulizer won $20,000 to help address that problem with a device it claims can help 90 percent of patients struggling to breathe, at a fraction of the cost of traditional ventilators. The money was part of the company’s first-place finish in the annual MIT Sloan Healthcare Innovations Prize competition. The event, which is open to entrepreneurial students from Boston-area colleges and universities, featured eight finalist teams pitching their health care innovations to a group of judges and a packed audience at MIT Sloan’s Wong Auditorium. Boston University graduate Shaheer Piracha and Harvard Medical School student Sanchay Gupta gave the winning pitch for the Umbulizer team, which also includes MIT alumni Moiz Imam ’18 and Abdurrahman Akkas ’18, MIT mechanical engineering student Wasay Anwer, Boston University student Rohan Jadeja, and Farzan Khan, who recently graduated from New York University Abu Dhabi. The company’s device looks more like a desktop printer than a traditional bedside ventilator and is capable of running on batteries for added mobility. After an operator connects the device’s single tube to a patient, it rhythmically pumps a safe amount of air into their lungs. Umbulizer’s device will cost around $2,000 compared to the $15,000 price tag of regular ventilators. The key to the student team’s cost savings is its decision to focus on providing the four most common functions of ventilators with their device. Machine ventilators are typically designed to perform 15 different functions, many of which are rarely needed to save a life, Piracha told the audience. The team is currently focused on bringing its solution to Pakistan, a country with over 200 million people that Piracha says has less than 2,000 machine ventilators across all of its hospitals. The company says early results from a clinical trial there are promising.